The US wants Turkey to join the military effort against Islamic State at Kurdish-dominated Kobane, across the Syrian border—but Ankara’s focus is the Kurds within its own. Kobane, a Kurdish enclave along the Syrian-Turkish border since July 2012, now stands at the epicentre of the international struggle against the al-Qaeda splinter group Islamic State (IS). For more than a month now, the Syrian People’s Protection Units (YPG) have been waging a fierce struggle to prevent the city from slipping under Islamist control. YPG is tenacious in its defence but lacks the resources to bring the battle to a successful conclusion. Until late October, outside ammunition came only via US-led airstrikes and airdrops, insufficient to release the IS grip on Kobane. The fighters need additional boots on the ground—preferably from the neighbouring states of Turkey, which has chosen to stand on the sidelines, and Iraq, which has only recently sent peshmerga forces into the conflict zone, despite the battle raging just across the border. Why is the Turkish president, Recep Tayyip Erdoğan, unwilling to “do what it takes” in Kobane—steering clear of the US-led military coalition against IS despite his country’s proximity? The argument that runs through Western media and the opposition to the AKP is that Turkey actually supports IS. The leader of the German Greens, Claudia Roth, alleges that there are IS training facilities and recruitment centres across the country. And the chair of the Republican People’s Party (CHP), Kemal Kılıçdaroğlu, has claimed that Ankara has supplied arms and munitions to the militants opposing the Syrian president, Bashar al-Assad—albeit without reliable evidence. Some developments, however, suggest a working relationship. Despite its fanatical iconoclasm, IS has not destroyed the tomb of Suleiman Shah, the progenitor in Syria of the Ottoman dynasty. Its release of 46 Turkish hostages in September has also raised new questions about Ankara’s relations with IS. Erdoğan had presented the hostages as the reason behind Turkey’s reluctance to play too active a role, fearing retribution. But even after their release he remains wary and expresses disquietude with the military alliance led by the US president, Barack Obama. Late last month, Erdoğan said that Washington had not yet clarified what role it expected Turkey to play. But Tolga Tanıș, an investigative journalist based in Istanbul, reported via Pentagon sources that Washington had specifically requested access to two airbases, one in İncirlik for airstrikes against IS, as well as the naval base in İskenderun (“Erdoğan’in yüksek riskli oyun planı”, Hürriyet, 26 October). It is unlikely Erdoğan has been kept in the dark. It is not difficult to see why the US wants Turkey to come on board: not only does it have the second largest army in NATO but it has already deployed tanks to the border and could easily tip the balance by firing its first shot. And Ankara is a part of the anti-IS coalition; its membership, though, has several preconditions attached, including the stipulation that the US commit itself to bringing Assad’s time in office to an end. Whereas Washington is focused on “degrading and ultimately destroying” IS at Kobane, regime change in Syria is Turkey’s main objective. It maintains that the conflict in Kobane is directly connected to the war against Assad, claiming that the disenfranchisement of the Sunni majority in Syria will continue to generate fundamentalism even after the military defeat of IS. Unlike Obama, Erdoğan is adamant that pushing IS out of the region will provide but temporary relief, and that a permanent resolution is dependent on dislodging the Syrian president. These concerns about the Assad regime carry weight—but not quite enough. Erdoğan’s disinclination to have “Turkish boots on the ground” has more to do with the long-simmering question of Kurdish autonomy. The battle for Kobane is being led by the Democratic Union Party (PYD), which shares the ideology of the Kurdish Workers’ Party (PKK), embroiled for three decades in a conflict with the Turkish state over the fate of the Kurdish-dominated south-east. Should the PYD walk away victorious from the battlefield, it might embolden Kurds in Turkey to seek greater autonomy and could engender a united Kurdish front spanning south-eastern Turkey, western Iraq and northern Syria. Erdoğan has taken precautions against just such a scenario. At a secret meeting on 5 October with Saleh Muslim, leader of the PYD, his ministers stipulated that Turkish support would be contingent on several factors: PYD forces would become part of Turkey’s buffer-zone project, they would join the Sunni coalition against the Syrian government and they would dissolve their autonomous enclaves. It is easy to decipher this ultimatum: either surrender to Ankara at the negotiating table and join Turkey in the struggle against Assad, or face defeat at the hands of IS militants on the battlefield. As days passed Turkey’s position changed, closely related to Kurdish dynamics. Ankara had refused passage to Iraqi Kurds en route to the battle, blocking the only land channel for fighters and ammunition to reach anti-IS forces in Kobane. In a remarkable reconfiguration on 20 October, the foreign minister, Mevlüt Çavuşoğlu, announced that Turkey would open up its territory for the peshmerga to reach Kobane. Some optimists have interpreted this as a harbinger of Turkish willingness to co-operate, yet the international community should be wary. It could as well be a tactical move by Erdoğan to relieve some of the criticism of his handling of the crisis: if examined carefully, the announcement contained more empty rhetoric than substantial promises. Çavuşoğlu even held back on how the peshmerga units would make their way into Syrian territory and whether they would receive any logistical support from Turkish forces at the border. Allocation of Massoud Barzani’s peshmerga could also supplement, even reinforce, Ankara’s strategy, as the president of the autonomous Kurdish Regional Government in Iraq maintains a close working relationship with Erdoğan. The leader of the PYD has already expressed scepticism as to the motives behind deploying these fighters, who might disrupt the Kurdish gains at Kobane. 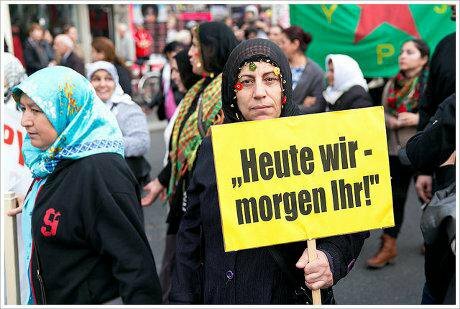 A "Berlin ist Kobane" demonstration in the German capital in September. Montecruz Foto / Flickr. Some rights reserved. The lack of activism in Ankara runs the risk of derailing the peace process initiated roughly two years ago between the PKK and the Erdoğan government. The PKK’s operational commander, Cemal Bayik, as well as its imprisoned leader, Abdullah Öcalan, have made clear that it would be automatically terminated by the fall of the besieged town. Kurds are already angry: violent protests have erupted in past weeks in Istanbul and Ankara and in Germany. The overwhelmingly Kurdish towns of Batman, Diyarbakir, Muș and Siirt in Turkey have witnessed clashes between IS sympathisers and Kurds, causing severe casualties and several deaths—and prompting the administration to impose curfews on Kurdish cities along the south-eastern border. Yet the question is: does Erdoğan care? What does he hope to gain? His reluctance does not stem from mere stubbornness but Realpolitik, as his main objective is to weaken the PKK. As the hub of the Kurdish region, Kobane lies between a swathe of Kurdish-controlled towns, collectively known as the canton of Jazeera, and the town and district of Afrin; if IS were pushed out of Kobane, these two cantons would be linked in a chain bringing the Kurdish ideal of an autonomous state into the realm of the possible—or, at least, furnishing Turkish Kurds with enough leverage to demand the quasi-independence Syrian Kurds snatched from Assad in northern Syria in the summer of 2012. Kobane’s fall to IS could trigger the successive collapse of Kurdish strongholds, enabling it to move westwards towards the region north of Aleppo and even to cement its grip on a broader strip, roughly stretching from the Syrian border in the west to the outskirts of greater Baghdad in the east and from Babel province in the south to Mosul in the north. The fighting at Kobane has already weakened the Kurdish rebels and, if weakened further to the verge of neutralisation, they will be less able to resist the political demands of Ankara at the negotiating table. By contrast, should the Kurds win at Kobane it would be more difficult to achieve the disarming of the PKK. More than anything else, the Turkish president is motivated by opportunism, treating the peace process as a bargaining chip for his other political goals. Perhaps his support will arrive, when the Kurds have realised that quasi-independence is not a viable option. Erdoğan also faces mounting internal pressure. With upcoming elections the president has to watch his electorate, an overwhelming portion of which would not support aiding an entity already perceived as linked too closely with the PKK. Ankara will not extract any political or territorial gains from becoming involved in the conflict; only the Turkish-Kurdish peace process runs the risk of being derailed and it is far from certain whether aiding the Kurds would set the conditions for lasting peace with Ankara. In this sense, “doing what it takes” at Kobane becomes above all a humanitarian concern—and, according to Erdoğan, one not worth the risk of opening the borders to retaliatory attacks or stiffening the morale of the Kurds. If the struggle against Assad is Ankara’s official motivation to remain idly on the sidelines, the Kurdish problem is then the real driver. Erdoğan clearly has his own vision for the region and the conflict offers him an unconventional opportunity to see it unfurl. In addition to their disagreement as to whether Assad is the root cause of regional radicalism, Erdoğan finds Obama’s thinking devoid of any operational logic. Granted, the Western response may achieve the short-term objective of curbing IS’ military capacity, but what about the state-building measures to follow? Obama has said NATO forces will be working with the Syrian opposition—an opposition splintered into 1,500 groups of various leanings, with Washington providing arms and funds to 14 militias in south Syria and 60 groups in the north. The Free Syrian Army is furthermore experiencing a power struggle in its top echelons, where three military commanders have professed to be the “rightful supreme leader”. The fact that none of these opposition forces is secular or democratic posits another problem: which will assume a leadership role, after IS has retreated? Unlike the US, Turkey is looking at the mess that will remain in the post-conflict Levant. For instance, what if Assad regains control over the northern territories? There is no guarantee that he will not follow an aggressive policy against Syria’s neighbours, especially having secured the backing of Russia and Iran. In this regard, Erdoğan and the Turkish prime minister, Ahmet Davutoğlu, are not entirely at fault in their preferred international solution: a no-fly zone over Syria and a humanitarian corridor along the Turkish-Syrian border, providing a “safe haven” to accommodate the refugees fleeing Syria, now numbered at nearly 1.5 million. Turkey wants a clear indication that the border will be safe—and that means Assad toppled and Kurds disarmed. As Akın Ünver has eloquently put it, intensifying the air campaign will provide only a “band-aid solution” for wounds that in reality run far deeper and wider. Resolving this conflict requires rather a political commitment to a post-IS settlement, drafted and agreed by the key players in the region. Obama will then have to factor in the interests of the local powers if he is to avoid another failure after the debacle in Iraq. Turkey may be committing a humanitarian faux pas through its non-involvement, but its concerns about the future of the Kurdish problem and fate of the region cannot be dismissed as unreasonable. In this sense, Erdoğan is doing “what it takes” at Kobane. It’s just not what Obama wants him to do. This is an edited version of a commentary which originally appeared in the Global Turkey in Europe series. Syria's peace: what, how, when?